In Wrath of Leviathan, the second book of the BetterWorld trilogy, Waylee faces life in prison for daring to expose MediaCorp and the president. 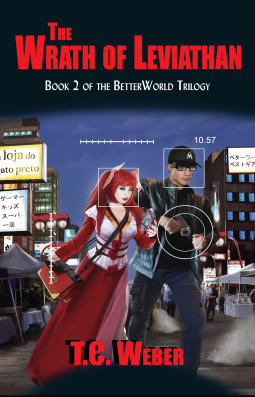 Exiled in São Paulo, her sister, Kiyoko, and their hacker friends continue the fight, seeking to end the conglomerate’s stranglehold on virtual reality, information, and politics. But MediaCorp and their government allies may quash the rebellion before it takes off. And unknown to Kiyoko and her friends, a team of ruthless mercenaries is after them, and is closing in fast. Wrath of Levfiathan is the second book in the BetterWorld trilogy. The first book, Sleep State Interrupt, is also currently available on NetGalley. The final book in the trilogy, Zero-Day Rising, is scheduled for publication in 2019. "With a compelling and diverse cast, great pacing, and near-future cyberpunk gunfights, T.C. Weber’s Wrath of Leviathan will keep you entertained all the way to the end." "The Wrath of Leviathan is smart, political, and disturbingly current."